Organic Sales: All products sold in Nourish Organic Market are USDA certified organic, with the exception of some local products (standards are explained below). Produce needs to either be certified organic or meet the store's organic production practice standards of OMRI (Organic Materials Review Institute) approved inputs and production processes (these products are labeled “organically grown. )” The store also stocks hydroponic produce items that are labeled as such. Vendors are informed that all manufactured foods are required to be certified organic, and that locally manufactured items need to contain certified organic ingredients in the case of suspect ingredients, such as corn and soy. All meat and dairy products must be locally/regionally produced from animals that are pastured/grass fed, and raised on organic feed. The store will work with producers who are transitioning to organic feed. Organic produce and livestock feed that is not certified needs to meet Nourish Organic Market's organic production standards. Several local bakery vendors have substituted ingredients to continue doing business with Nourish Organic Market. On the rare occasions when non-organic products were accidentally stocked those products are removed, discontinued and donated for hunger relief. Product information is primarily shared through conversations with shoppers. 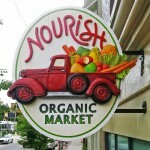 Local produce that is not certified organic is either labeled “organically grown” or “hydroponically grown.” Nourish Organic Market and Deli is a Non-GMO Project Participating Retailer.